I had an experience at church this weekend y’all. A holy and filling one that stirred me immensely. While singing the lines of a familiar hymn, the atmosphere shifted with such force that tears cascaded from my eyes without warning. I worshipped, devoid of abandon, and the thick outpouring of the Spirit drenched the desert that was my parched soul. Like water to the Serengeti, God revived what had felt lifeless and barren for longer than I care to admit. The song began low and unassuming. Lyrics I had heard all my life passed through my lips by rote, and then as if I had been holding my breath waiting for this single line, the words “Strength for today, and bright hope for tomorrow, blessings all mine, with ten thousand beside” rose up from somewhere deep inside. My hands lifted in praise as I thought about the past few months. The distractions, the difficulties, the heartaches, they all seemed to pale in comparison to this affirmation of faith. No matter the malady, God’s strength is for today! Despite the despair, there exists bright hope for tomorrow! And because He is such a good, good Father, the blessings of God were ALL mine. Friends, listen closely here…not just one blessing. Ten thousand blessings beside the one I have been hoping and praying for! This hymn broke through the walls of shame and fear. The heaviness that had accompanied recently made hard choices was lifted, and I felt an fresh infusion of sufficient grace holding me up in my weakness. I love to sing, and almost 90 percent of the time you hear me do so, it will be a hymn. Why? Well, lyrics. My childhood faith and relationship with God was borne out of and supported by many of the hymns I heard, sang, and memorized in church. While I enjoy a vast range of music, I often recall old hymns to reset myself. The poignant prose of hymns speak to me on a cellular level. The words are intertwined and woven into my spiritual journey, threaded solidly in my experience as a Christian. 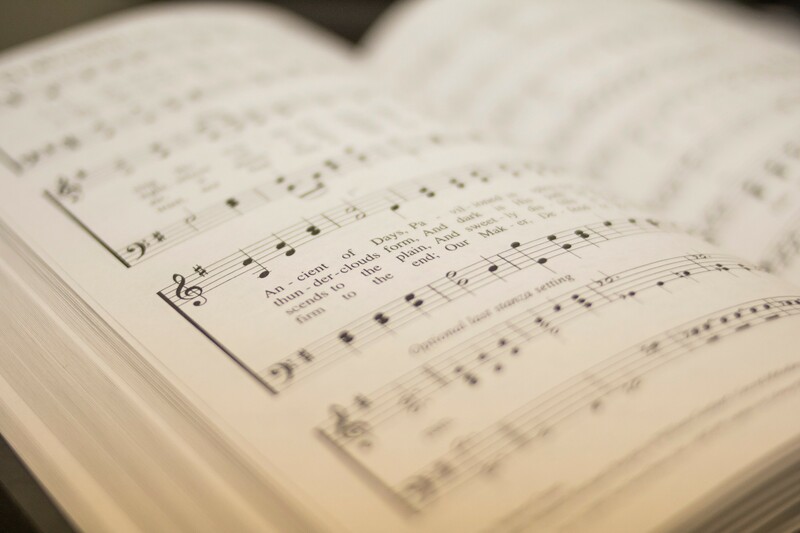 My mother sang hymns and many of the ones she sang can only be found through google (thank you internet people) and the backs of old Baptist pews as some churches have begun to move away from hymnals and using hymns for congregational singing. Hymns still have the power y’all. And let me be abundantly clear; the power is the Spirit of God to Whom we worship. The God of the hymns. Even if you don’t sing publicly (or audibly), humor me and take a quick minute to see if you can think of a hymn you used to sing or maybe still enjoy singing in church. What lyrics stand out most to you? Is it a line? A stanza perhaps? The chorus? I am so grateful that this hymn affected me they way it did this weekend. Along with a few goosebumps, it gave me a renewed appreciation of God’s faithfulness in the middle of my mess (and yes you can go to church and still be a hot mess, you are loved anyways). It gave me just enough light for the step I’m on. For that God, I’m grateful. If you’ve enjoyed what you’ve read, look for me on social media as Quantrilla Ard or The PhD Mamma for more inspiration, encouragement, and truth/story-telling in a practical and relatable way. We’re in this together.